Bill Walton took to Reddit yesterday to answer a bunch of questions, and befitting a guy who once asked "Have you ever been to a volcano?" to his broadcasting partner to end a 30 second tangent about Las Vegas, the questions were weird and his answers were weirder. The volcano even made an appearance. 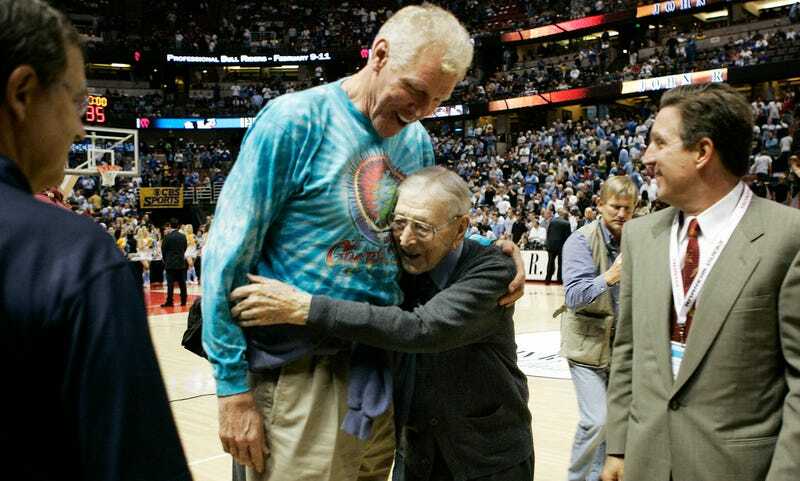 Some of the more bizarre question-and-answers are below, but you should click through to check out the rest, like Walton's genuinely sweet answers to questions about John Wooden, the Grateful Dead, Dr. Jack Ramsay, and his son Luke. Oscarveli: What is the story behind being milked? It's the most pleasurable experience in the world! When you're on a great team and you get hot, your teammates milk you dry - they wear you out and there's nothing like being on a great team. When you're on a bad team and you get hot, they freeze you out because they figure they have to get theirs before the game's over. Never forget - happiness ends when selfishness begins. I love being hot and there's nothing in the world like being milked. sousedbergin: This answer exceeded my wildest dreams. There is nothing like a wild dream. Chase your dream. Make your dream reality, make your dream your life, make your dream you job and somehow find a way to get milked. EmbracedByLeaves: Do you think you could beat Abraham Lincoln in a knife fight? I'm all about peace and love. We were just with Ringo the other night and he reinforced my longstanding commitment and dedication to those ideals. I like to win and I play to win. Coach Wooden's 2 favorite people on Earth were Abraham Lincoln and Mother Teresa. I used to love the tales that Coach Wooden would tell of he and Young Abe growing up together in the Midwest. aburks41: Have you ever been to a volcano when its erupting? We were on tour with the Grateful Dead in Oregon. They were playing the show and they start playing Fire on the Mountain. The volcano next door, Mt. Helens, blows up. When the show was over a bunch of us raced to the airport and boarded a plane. We told people at the airport we were scientists studying atmospheric conditions and the effect of smoke and volcanic explosions on the human spirit, so the pilot was terrified, but we convinced him to fly right into the smoking crater with fire and lava everywhere. He wanted to go home but we were on a scientific mission and we kept getting closer and closer. As we were flying around inside the erupting volcano, the military jets scrambled from the local base and come up there to get us out of there. It was a real dogfight but we had the spirit of Cortez on our side. We eventually left and when we landed at the airport the pilot was most relieved as we quickly fled and went back to the rest of the tour. Viol33: Will Cortez be available for questions? Perhaps via Vine? Cortez has a very busy schedule. I love my teepee, I love my bike, I love Cortez, I love my jacuzzi, I love Lori. You can always come check our teepee out - never a problem, but if you want your own, go to tipi.com. As for my great friend Jeb, tell him you're a friend of mine. Open your heart, open your mind, open your spirit and soul, and let the sun shine in. I am a human solar panel. I love my teepee - I used to live in it until I married Lori. Her idea of camping is when the Ritz Carlton goes to a limited menu at 4am.